Well, the festive season is rapidly approaching and it’s high time I came up with some suitably-themed posts! So here are a couple of recipes for making treats that are perfect to give as gifts, as well as keeping all to yourself. NB For the best possible texture to your finished fudge, a sugar thermometer or therma-pen is necessary. I love the intense fruits/spicy/boozy/citrus flavour of mincemeat, especially since I started making the vegetarian/vegan/fat-free/no-added-sugar mincemeat inspired by a recipe from Hannah Glasse. However much I love the flaky, buttery-ness of a puff pastry mince pie – FYI, it’s a LOT – sometimes, I just want to enjoy the filling. Since it would be undignified to spoon it straight from the jar – *poker face* not that I’d ever do that – I thought that making it into fudge would be an ideal way for a handy-sized hit of festive cheer. This recipe is a variation of the only fudge recipe you’ll ever need – and an adaption of the aforementioned mincemeat recipe. There is less liquid and more spices, in order for their flavours to survive being added to the hot fudge mixture. Put the sherry, brandy, lemon and orange juice, dried fruits and spices into a small pan. Stir gently to combine and set pan over the lowest possible heat. Cover and let the mixture stew gently until all the liquid has been absorbed. The mixture should be moist, but with no liquid visible in the bottom. Mix the zests, nuts and candied peel and set aside. Bring to the boil and stir continuously until it registers between 118°C and 120°C on a thermometer dipped into the centre of the pan. Make sure the tip of the thermometer doesn’t touch the bottom of the pan, as this will be much hotter and the thermometer will thus give a false reading. When your fudge reaches temperature, remove from the heat and allow the bubbles to settle. Pour into your stand mixer and use the beating paddle (not the whisk) to beat slowly for at least five minutes, to cool the fudge. When the mixture has cooled and thickened, add the soaked fruit, nuts and peel and stir to combine. The sweetened, condensed milk recipe above can satisfy 99% of your fudge-related requirements: the texture is excellent, it is easily flavoured with a range of simple additions, and even ‘plain’ is delicious. However, everything can be improved on, if your palate is demanding enough, and so if plain and unadorned pure flavours are your thing, then this is the recipe for you. If the above recipe is the regular champagne of fudge recipes, then this recipe is vintage. I have adapted it from a recipe published online by Nick Dudley-Jones, reducing the sugar slightly and merely adding detail where his recipe was more free-spirited. The quality of the ingredients is what sets this recipe aside, so be sure to use the very best you can get your hands on and you will reap your just rewards. Line a rectangular, 30cm by 24cm baking pan with parchment. Put the sugar, cream, butter and glucose into a thick-bottomed pan. Put the seeds and the pod into the pan with the rest of the ingredients. Heat the ingredients gently until the sugar has fully dissolved. Raise the heat and bring to a rolling boil, stirring all the time. Continue stirring and cook until the mixture reaches 118-120°C. When the bubbles have subsided, fish out the vanilla pod. Pour the fudge into the bowl of a stand mixer and beat slowly for 5 minutes to cool and grain the mixture. After 5 minutes, slowly add in the chopped chocolate, pausing between each addition until it has melted. Continue to beat the mixture slowly until it thickens. This will take a further 7-10 minutes. The texture should be similar to marshmallow fluff/putty/uncooked sponge cake mixture (pick whichever of those analogies is most recognisable to you). Spoon/pour the mixture into your parchment-lined tin and smooth over. Set aside and allow to cool at room temperature for 3-4 hours. Chill if liked for extra firmness and to achieve razor-clean cuts when dividing it up. Cut into cubes with a sharp knife and store in an airtight box. If you can exercise the self-control, the flavour of this fudge is best if first allowed to mature for 24 hours, which gives the flecks of vanilla seeds time to release their aromas. Here’s a recipe you might want to try, now that fresh cranberries are back in the shops. After discovering the joys of home-candied peel a few years ago, I have since tried my hand at several different fruits. With it being the season for mincemeat and fruit cake decorating, when I spotted some punnets of fresh cranberries on sale, I thought I’d givethem a try. Hunting around on the internet, it seems many people’s idea of candied cranberries is to dip them in egg-white and roll them in caster sugar. Beautiful and festive and twinkly-frosty, but not really candied in the traditional sense. I also found no recipes on the traditional method of candying for these particular berries, so I thought I’d make up my own. This recipe takes about a week, but your active involvement is little more than an hour. Over the week, the delicate berries will gradually exchange their juice for sugar, thereby making the cranberries becoming more robust the more sugar they absorb, and as a bonus you’ll get a beautifully coloured cranberry syrup. For ease, select a pan you can get by without using for a week. Poke holes in each cranberry with a cocktail stick in order to let the juice out (and the sugar in). You don’t have to be too fastidious – I made about 5 or 6 holes around the middle. Layer the cranberries and the caster sugar in a pan – a wide pan is better than tall saucepan, for ease of gently moving the berries around later. Leave for 24 hours. The sugar will draw out some of the juice. Next day, heat the pan very gently to melt the sugar. You’ll probably have to add a little water to get it started – about 1/2 a cup. Shake, don’t stir – or if you absolutely have to, stir very gently. Vigorous stirring and/or heating will cause the berries to burst. Some will burst anyway, but try and keep that at a minimum by being gentle. Once the sugar is melted, turn off the heat, cover, and leave 24 hours. As the sugar is absorbed by the cranberries, they will gradually become more robust, but for the first day or two, you’ll need to be careful. Repeat the heating gently for 5 minutes then leaving overnight for 5 days. Gradually the syrup will become redder and the cranberries more jewel-like. After 5 days, warm the syrup (to make it easier to drain) and pour through a sieve to separate the cranberries from the syrup. To finish, the cranberries need to dry a little, so line 2 large baking sheets with parchment and scatter the candied cranberries over. Try and get them separated, to facilitate drying, but there will be some squished ones you can’t do much about at this stage. Last thing at night, put the trays in the oven and turn the heat to 170°C/150°C Fan for 5 minutes, then turn off and leave to dry overnight. Repeat the drying next day – 170°C/150°C Fan for 5 minutes then turn off and leave to dry. If extremely sticky, they might need another overnight drying (I did Friday night/Saturday day/Saturday night). Once only slightly tacky to the touch, they’re ready to use. I sorted mine into 3 groups: Perfect ones went back into the syrup (to keep moist) to use as decorations. I dipped a few of the not-so-perfect ones in dark chocolate, and rolled the rest in caster sugar and stored in a ziplock bag. The exploded ones I chopped and put in a jar for mincemeat. This has to be one of the shortest and salty-sweetest recipes on the blog. Deliciously simple and infinitely customisable, what’s not to love? Salted Caramel Oat Brittle with Salted Peanuts – although it could be with anything that takes your fancy: cranberries, apricots, cashews, macadamia nuts, flax, sesame and sunflower seeds….. I could go on, but you’re already starting to doze, so I won’t. Regular readers will know how much I love oats, and a little bit of salt with whatever you’re putting them into really brings out their toasty flavour, so salted nuts are my number one choice. This recipe is wonderfully moreish whether you’re using the highest quality ingredients or the cheapest of the cheap from the basics range of a supermarket. I’ve tried both and the taste is awesome whatever your budget can stretch to. The world is your crustacean of choice, but 500g of sweet and salty deliciousness for about £1.20 using basics ingredients is a bargain in anyone’s book. Best of all there’s no need for an oven – this treat can be prepared using just one pan on the hob – who needs mountains of washing up when there’s a treat waiting to be enjoyed? Actually, with this recipe, you might do – because you’ll need something to do while you wait until it’s cooled down enough not to burn your mouth, but *waves hands dismissively* ANYHOO…. Lay a sheet of baking parchment onto a chopping board or into a roasting tin, for the hot brittle. Pour the oats into a coarse sieve and shake to get rid of all the oat ‘flour’ that will have accumulated. There will always be some, whether you’re using the finest steel-rolled oats or budget basics. 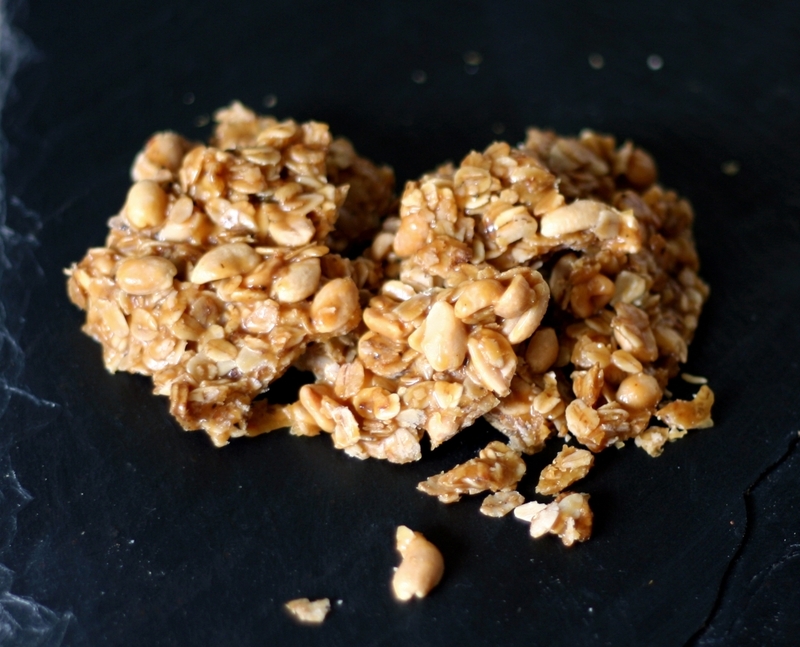 Ideally you want the finished brittle to be a delicious contrast between glossy caramel, toasty oats and crunchy peanuts, so getting rid of this ‘dust’ can only improve it’s visual appeal. Put the oats into a dry pan and toast them over medium heat to dry them out. You will be able to smell their nuttiness as they become toasted. Light or dark, your call. When you’re happy with the colour, pour them into a bowl and set aside. Wipe the pan clean of any dust and pour in the sugar. Set it over a low heat and DO NOT STIR. It will gradually melt and turn a rich caramel brown. Keep an eye on it while you’re NOT STIRRING, and shake the pan if necessary in order to move the sugar around. Keep NOT STIRRING until all the sugar has melted. Add the butter and stir briskly as it melts until it is mixed in, although don’t be too diligent – you don’t want the mixture to cool too much before the rest of the ingredients are added. Remove from the heat and add the toasted oats and nuts (and/or fruit and salt if using). Tip the mixture out onto the baking parchment and arrange into artistic clumps about the size of a walnut. You don’t want there to be huge lumps, because they’ll be difficult to break apart once the mixture is cooled. And then you’d have to eat those yourself *poker face* which would be a trial, but we can’t be having any waste, so somebody has to be prepared to do that. Once cooled, break apart into bite-sized pieces and store in an airtight container or zip-lock bag. Enjoy with coffee, tea or a good movie.